Graveyard Shift Sisters Turns 2! My first and only niece turned two on September 30th this year. And while I've spent a considerable amount of time with her and remember holding her receptive presence in my arms when she was only a few hours old, she's a pretty wise tiny human for someone still very much growing. This mirrors the station that paints Graveyard Shift Sisters now at the same age. Ripe yet undoubtedly still growing. I'm alright with having no precise design of exactly what the future of this space is. I only hope people continue to discover more women of color in the genre and their work. If there's one goal I can promise, it's to bring y'all completely unique content to the horror journalism landscape. This space would not be as diverse nor as rich if it weren't for all of the contributors who've managed to find time from their own busy schedules to write about matters of Black participation in the horror genre. This past year, Carolyn Mauricette and Tarik Davis joined our team and have written some of the most brilliant works of insight this year along with Takima Bly's fantastic interviews and character profiles & Eden Royce whose Black Women Horror Writers series roars forward. Additionally, much love to Jenny Dreadful for the visual branding. I still owe her for the kindness and effort she put into bringing my original visions to life while having the room to put her own personal touch on it as an artist. With the magical month of October upon us, we would be remiss not to join all things horror and Halloween! 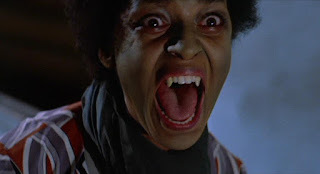 21 Shades of Blackness in Horror Films from the 1970's and 1990's is our very special #Blackhorror21 challenge starting tomorrow, October 10th and will last until Halloween Eve, October 30th. We'll spend each day sharing facts photos, and our thoughts on these films on Twitter and Facebook! Wanna jump in these discussions? Tweet us your opinions on these movies and/or watch them for the first (or 100th) time and tell us what you think all month using the #Blackhorror21 hashtag as a special Halloween feature with your musings will be highlighted on October 31st! Thank you everyone for reading and participating. We hope to continue to stand on the pinnacle of greatness in year three!